SMA Studios, the production arm of Seattle Mosaic Arts, developed as a natural offshoot of the studio. We realized that combining the resources of the studio with the combined talents of the staff and other mosaicists, we were perfectly situated to produce mosaics for commissions and other larger projects. We have found that working as a team has really augmented the process. Not only do we have the benefit of group creative input, but the team approach also allows for efficient progression through the steps of the process, ensuring timely completion of the commissioned work. 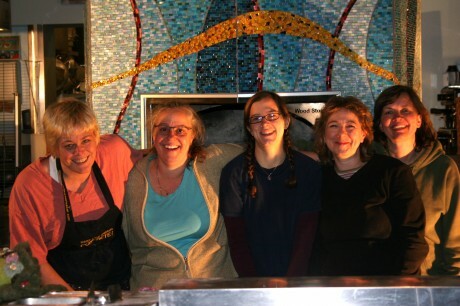 The core group of mosaicists is made up of Claire Barnett, Emily Margherio, Veronica Mortellaro and Alexandra Immel. Depending on the size and scope of the project, we have many additional SMA mosaic artists who help with the projects. We accept commissions for private, commercial and public mosaics. We will work with the client from inspiration phase on, to help create the right mosaic for your space. Our methodology allows for great variety of involvement. We can do all the design, production and installation for you, or a very fun and personal option, we can work with you to help you have a direct hands on experience with creating the mosaic for your space. Our most recent, and largest to date, commissioned commercial project has been to mosaic the facade of a large wood burning commercial oven. You can read more about this work and see step-by-step progression here. For more information re: commissions please contact us. Because we utilize the extremely friendly and easy double indirect method, the opportunities to create gorgeous group projects are endless. We can do both small and large scale installations with a wide variety of community involvement. For example, as a fund raising/development campaign we can help you design a growing mosaic that any number of people can work easily on, from kids to adults of all abilities. This method allows us to envision installations and group community projects from a simply wall hanging all the way to large scale outdoor installations. Contact us to begin this exciting, creative process.